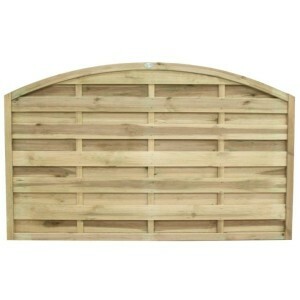 The 3.5ft tall decorative Europa Domed Fence Panel from Forest is an excellent panel featuring smooth-planed, horizontally mounted timber boards with a grooved profile. The boards of this panel are arranged in a staggered pattern onto either side of mounting battens, then supported by a high quality rebated, mortise and tenon jointed frame. The domed shaped top makes an attractive and decorative feature to your fence panel run when using as a low-level boundary marker or partitioning.